Just a day before the Europacup Streif Downhill, Daniel Danklmaier was still critical of himself: “A few of the turns still need some improvement. I hope my nerves can handle it tomorrow.“ A day later, the Styrian knows one thing for sure: He’s got good nerves – nerves of steel. With bib number 1, the 25-year-old garnered victory at the Europacup Downhill with seeming ease and a time of 1:21,19. There were hints of Austrian victory two days before the event. After achieving the best time in the first Europacup training on Saturday, Danklmaier sped away from his competitors yet again in the second training on Sunday. Be that as it may, the likeable Styrian racer remained modest and didn’t see himself as the outright top favourite: “There are other favourites from Italy, Switzerland and Canada, too.” In the end, however, there was just no beating him in Monday’s main event: With good weather and piste conditions, the 25-year-old showed excellent form in Kitzbühel and relegated the Swiss duo Nils MANI and Lars ROESTI to second and third places respectively. 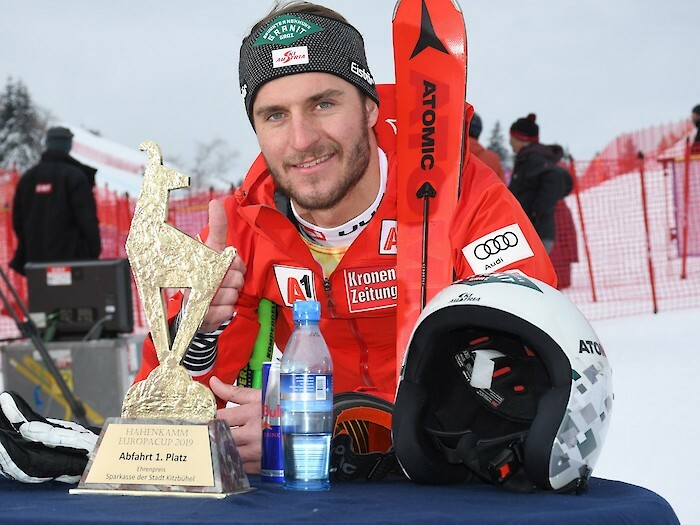 The highly prestigious victory on the Streif marks Danklmaier’s biggest success this season: In his five previous races, the Austrian had made it among the top ten four times, but never onto the rostrum. Competing mainly in the Downhill and Super-G, a talent for skiing proverbially fell into the speed-specialist’s hands: His mother, Elisabeth Kraml, was once a ski racer herself, so it’s only natural that her son would also develop a love for whizzing around on two planks. After first steps with his hometown ski club, TVN Haus im Enntal, Danklmaier went to Schladming to attend secondary school with a focus on skiing. At 15 years of age, he entered his first FIS races. In 2012 and on home soil, the Styrian athlete celebrated his first Europacup victory at the Reiteralm Downhill. The 25-year-old’s talent was noticed – however, two cruciate ruptures in only 3 years caused bitter setbacks on his way to the top. Danklmaier fought his way back, debuting in 40th place in the Val d’Isère Downhill at the winter 2016 World Cup. After two years without noteworthy success stories in the elite circle, he drew attention to himself once more at his only appearance in Bormio so far, by coming 19th in the Super-G.
By the way, it’s not only today’s triumph that speaks for another Danklmaier appearance: It just so happens that the racer achieved his first World Cup points in 27th place two years ago on - you guessed it - the Streif Downhill. The Hahnenkamm Races and Daniel Danklmaier the fighter – a match made in heaven.